Chinantecos of Oaxaca , traditional huipils woven on back strap looms.hand embroideed blouses, They are located in the Mexican State of Oaxaca. Travel in this region is complicated by the large expanses of forests and dirt roads. Some of the towns at the time of my visit were only accessible by foot. 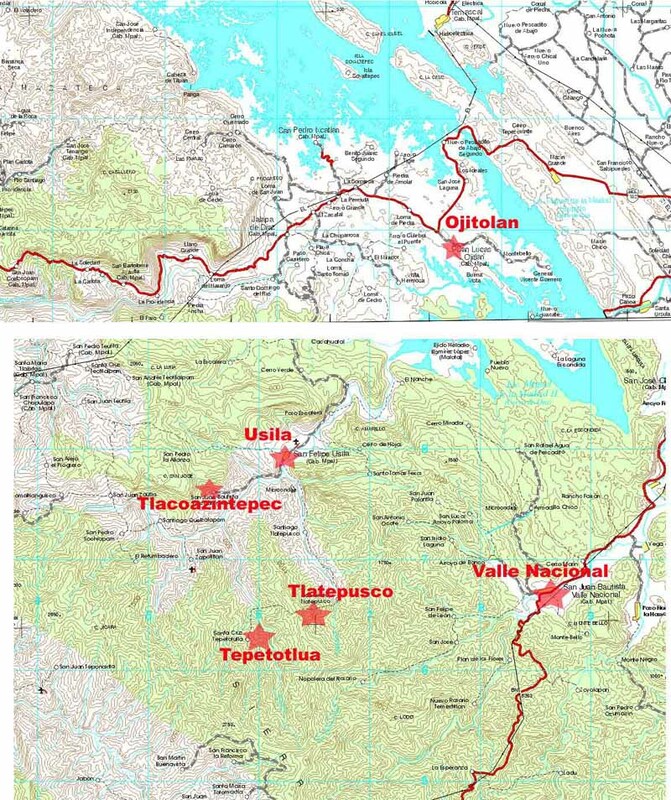 Valle Nacional and Ojitlan are easily reach by paved road, Usila and Tlacoatzintepec are at the end of a long dirt road(2002). Tepetotutla and Tlatepuxco were not accesaable at the time of my visit; however I have been told that the road building in the region may have now reached these villages. Rancho Choapan I have never found and use references on books on textiles to identify the huipil. The region is hot and humid and the Usila River during rainy season can be used by small launches to take people up the river to Usila. 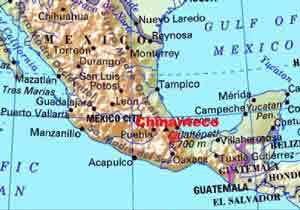 The Chinateca are located in the northeast part of the state of Oaxaca in an area called the Chinantla. The area is located in the River valley of the Papaloapan River and is surrounded by mountains. The river has tributaries called Santo Domingo, Valle Nacional and Usila that join the Papaloapan at different points. There are distinct climates in the region. The central part is hot and humid, to the north and the northeast it is temperate and humid, in the west it's cool and semi-humid, and in the east itxs hot and very humid. In 1980, there were 66,000 people that spoke Chinanteco. There are a number of different dialects of Chinanteco, which makes it impossible for some communities to communicate with one another. The economic activity is fundamentally agriculture; they grow corn, chili, tobacco, coffee, beans, and rice. Except for the corn and beans, the crops are sold in the local and regional markets. The Chinateca practice Catholicism but still conserve some of the rituals associated with their ancient beliefs, such as venerating the lords of the mountains and the god and goddess of corn. This combining of traditions is characteristic of many Mesoamerican societies. Traditional weaving and handicrafts are gradually disappearing from these villages. Embroidery of non traditional crafts such as napkin, bedspreads, table cloths, blouses nontraditional blouse is a main source of income among the women of the region. There are many women who retain the knowledge of weaving and the back strap loomed patters of the Chinateca, however they no longer spend the long hours working on these garments. The colorful huipils from these towns are worn mostly by the older women. However during festivals many people wear these wonderful embroidered garments.